Proactiv Acne Solution Systems Review: NO Scam, Best Acne Product? You are here: Home / Blog / Proactiv Acne Solution Systems Review: NO Scam, Best Acne Product? Proactiv is a popular, celebrity-endorsed, self-described ‘America’s #1 Acne brand.’ But do their acne products really live up to the hype? In this review, you are going to find out about this product, who created it, how it works and the reason why you should give them a try if you have acne. Proactiv has been around since 1995. 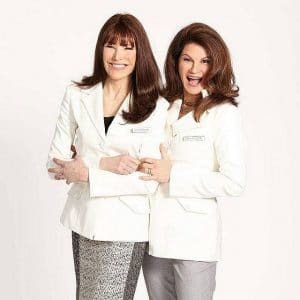 Its skin care products were first developed by dermatologists Katie Rodan and Kathy Fields and then officially launched by California based marketing company Guthy-Renker. By 1999, the company had already begun advertising on TV, with its first celebrity spokesperson being actress Judith Light. By 2005, it had added two more celebrity spokespersons: Jessica Simpson and Alicia Keys. Three years later, actress Julianne Hough joined the spokesperson list, followed by Olivia Munn in 2014. The latest celebrity to join the Proactiv spokespersons club is Kendall Jenner who, in January this year, announced her partnership with the company in a dramatic fashion not a few people took issues with. Now she’s currently the face of the company. Celebrity endorsement aside, Proactiv has also partnered with several companies and shopping centers, opening kiosks in over 100 locations in the US. They also partnered with Amazon in 2015, as well as with Nestle Skin Health, the latter forming a joint venture with Proactiv in 2017 to form The Proactiv Company in 2016. 2. Second Stage. Oil (from the skin’s sebaceous glands) begin to collect at the clogged pores, creating a perfect breeding environment for Propionibacterium acnes. This bacterium is normally harmless and lives in human skin but in clogged up situations like that it becomes problematic. 3. Third Stage. The P. acnes bacteria begin breeding inside the clogged up skin pores. 4. Fourth Stage. Due to the increased activity of this P. acnes bacterium and the waste it produces, the skin reacts by becoming inflamed, leading to the painful breakouts. 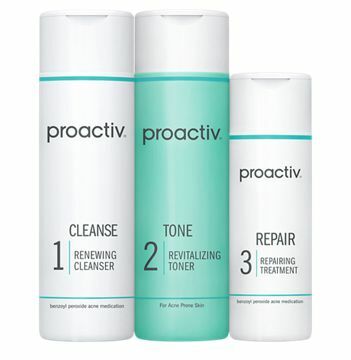 Proactiv claims to work by stopping acne at its every stage and preventing new breakouts from happening. Now how does it achieve this? 1. Benzoyl Peroxide: This is the flagship active ingredient of Proactiv. It is a proven over-the-counter medication that is especially effective in killing P. acnes, the bacteria responsible for pimple breakouts. It also aids in unblocking skin pores and thereby preventing the accumulation of dead skin cells and oil in them. It also has anti-inflammatory effects. 2. Adapalene: This is a retinoid (Vitamin A derivative) that, until recently, was only available by prescription. It has been used by dermatologists to cure acne for decades. Adapalene works by clearing skin pores of dead skin cells and excessive oil, preventing P. acnes from getting trapped in these pores. This effectively removes the environment necessary for breakouts to occur. In addition, Adapalene has anti-inflammatory effects. So it eases the pain caused by a growing pimple. 3. Salicylic Acid: This is another ingredient widely used in Proactiv products. This acid is in the WHO’s Model List of Essential Medicines, a guide to the most important medications needed in a basic health-care system. So its effectiveness is indisputable. Salicylic acid works by clearing the skin of deep dirt and causing dead skin cells to loosen and come off. It is a natural skin exfoliant that has been used for over two millenia in medicine. However, salicylic acid does not kill P. acnes. 4. Glycolic Acid: Glycolic acid is a sugarcane derivative that, like salicylic acid, works by exfoliating the skin. However, unlike salicylic acid, glycolic acid also has moisturizing effect, which means that your skin won’t be dry. This is important because dry skin causes the production of more oil by the skin’s sebaceous glands, which leads to pimple breakouts. All these ingredients are well known in dermatology for the treatment of acne so their efficacy is indisputable. 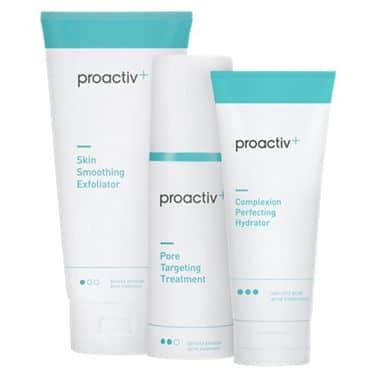 Proactiv has three different combinations of their acne products and now we’re going to look at each of them. a. Renewing Cleanser: This is what you use to wash your face to remove surface dirt, oil, etc. You are supposed to use this cleanser twice a day, in the morning and evening. b. Revitalizing Toner: After using the cleanser, you apply the Toner to ‘sweep away any remaining impurities’ and help the skin ‘to achieve the perfect pH.’ Like the Renewing Cleanser, you’re supposed to apply it twice a day, in the morning and evening. c. Repairing Treatment: This is the product that contains benzoyl peroxide. All you have to do is apply it to the washed and toned face twice a day, in the morning and evening. Proactiv Original 3-Step system is suitable for everyone, especially for teenagers. 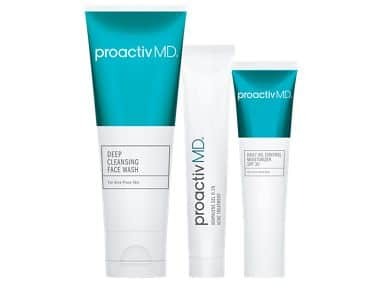 This is just the original Proactiv Solution 3-Step system plus what the company calls ‘Smart Target technology,’ which is supposedly going to help deliver the acne medicine ‘directly into the [skin] pores.’ The active ingredients include benzoyl peroxide and salicylic acid. a. Skin Smoothing Exfoliator: This is what you’ll use to wash your skin and prepare it for acne treatment. Its active ingredient is benzoyl peroxide. b. Pore Targeting Treatment: After using the Exfoliator, the next step is to apply at least two pumps the Pore Targeting Treatment to the entire face. Its active ingredient is also benzoyl peroxide. c. Complexion Perfecting Hydrator: This product is designed to ‘calm redness, brighten tone and fade post acne marks.’ Its active ingredient is salicylic acid. You are supposed to apply it to the face as the last step, and wear sunscreen if you’ll be going outside. According to Proactiv, you should repeat these steps twice a day, in the morning and evening. This particular system swaps out benzoyl peroxide for Adapalene, the retinoid drug that, until recently, was only available via prescription. Unlike the other systems, Proactiv MD also includes skin moisturizer and sun protection. It is also the product Kendall Jenner reportedly used to clear up her acne. a. Deep Cleansing Face Wash: This is used to wash the face and prepare it for treatment. Also contains ‘exfoliating beads’ to help ‘resurface’ the skin. It’s recommended to use it twice a day, in the morning and evening. b. Daily Oil Control Moisturizer SPF 30: This product doubles as a moisturizer and sunscreen. It can also be used under makeup and is applied liberally as desired once a day, in the morning. c. Adapalene Gel 0.1%: This is the main treatment. It has to be applied once a day in the evening, together with a moisturizer. Suitable for people 12 years and older. Adapalene is known to cause a reaction known as ‘retinization’ – when the skin becomes dry, reddened and irritated. Hence the reason why using a moisturizer is a must to alleviate or prevent it from happening. Since Proactiv is using known medical drugs in their system, there are obvious side effects, the most common of them being skin dryness, redness and irritation. Most of these side effects can be eliminated by reducing the number of times a day you use the product. 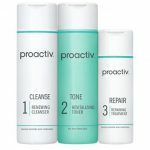 On the Proactiv website, the pricing of Proactiv products start at $19.99 for the Original and Proactiv MD system, whereas as for Proactiv+, it is $39.95. However, if you order from the website you’ll be automatically placed into a monthly subscription (or 90-day supply subscription if you choose). Over at their official Amazon store however, the prices are a bit higher, starting at $34.95 for the Original system, $40 for ProactivMD system and $50 for Proactiv+ system. These are one-time prices though. Entering a monthly subscription through Amazon is more expensive, starting at $33.20 for the Original, $38 for Proactiv MD, and $47.50 for Proactiv+. All subscriptions can be cancelled at any time. On top of that, Proactiv also comes in 30-day (all three systems), 60-day (Original system) and 90-day sizes (Original system, Proactiv+). There is also a ‘Mini Maintenance Travel Kit‘ of the Original Proactiv system available for subscription or one-time purchase. There is also a 60-day moneyback guarantee. So if you’re not satisfied with the product, all you have to do is to return the remaining products within 60 days of purchase to get your money back. From Where is Best to Order Proactiv: Amazon or Proactiv Website? Well it depends on your own preferences. However generally speaking, if you want a subscription, it’s cheaper to order from their website. But if you want a one-time purchase, then it’s best to buy from their official Amazon store. Proactiv is suitable for those who have mild to moderate acne. However if your acne is severe, then this product won’t be effective. You’ll have to see your dermatologist who will prescribe more powerful medications for you. Please note that the severity of acne is determined by a doctor. So don’t assume that you have severe acne. Let your dermatologist determine that. The products are relatively affordable. Presence of money back guarantee. These cons are not that big of a deal so it shouldn’t influence your decision. Final Conclusion: YES, TRY Proactiv Acne Solution Systems! So is Proactiv the best acne product in the market? I don’t think so. But does it work and so worth a shot? Definitely. So if you have acne and want an over-the-counter solution, then this product is a great choice. Feel free to use the comments section if you have any contribution to make. Thank you! Please note that I added Amazon affiliate links to this article as this is a positive review. What this means is that, should you decide to buy this product by clicking the Amazon links on this article, I earn a commission. This way I can earn a living and continue to maintain this blog as a source of honest, unbiased information. Please read my disclaimer for more information.